Dr. Isaías Íñiguez graduated from La Universidad Autónoma de Baja California. He went on to complete a post-graduate program in cosmetic dentistry from Baylor College of Dentistry in Dallas, Texas and became the first Latin American dentist accredited by The American Academy of Cosmetic Dentistry (AACD) in 1998. To this day, he continues to be the only accredited member of the AACD with a practice located in Mexico. 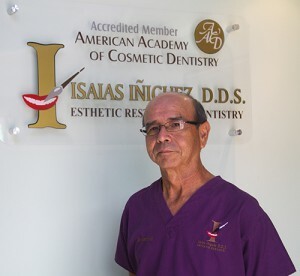 In addition to the AACD, Dr. Íñiguez also serves as an active member of the American Dental Association, the California Dental Association, and the Association Dental Mexicana. 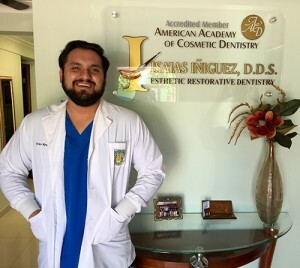 Attending professional conferences and pursuing post-educational opportunities, Dr. Íñiguez has dedicated his career to keeping up-to-date with innovative trends and the latest developments in dental technologies and techniques. His knowledge and experience in restorative dentistry have led him to become an international leader and educator within the field of cosmetic dentistry. 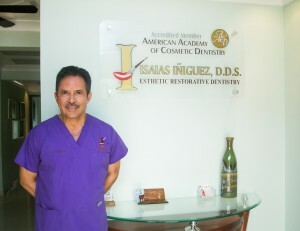 Creating beautiful smiles is Dr. Íñiguez’s passion, but he also enjoys a variety of hobbies. He loves to go off-roading with his sandrail in the Imperial Sand Dunes with his brother, Enrique, and his colleague, Dr. David Hornbrook. He also enjoys traveling with his family and taking road trips across the country. On the weekends, he likes to watch UFC or boxing matches, grill, and lounge in the pool with his baby granddaughters, Luna and Valentina. Jorge Martinez, DDS earned his Doctor of Dental Surgery from Facultad de Odontología de la Universidad Nacional Autónoma de México, where he also studied Dental Urgent Care. In 1991-1992, Dr. Martinez became the President and Founder of the College of Doctors of Dental Surgery in Los Algodones, Baja California. He is certified in dental implants and specializes in implant placement. In addition, Dr. Martinez remains up-to-date with the latest developments in his field by attending and organizing dental conferences. Dr. Martinez’s hobbies include playing tennis and singing karaoke. 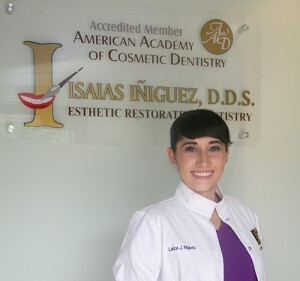 A graduate of The University of Arizona, Dr. Laiza Íñiguez Smith earned her dental degree from Universidad Rosaritense. She has been a member of the American Academy of Cosmetic Dentistry since 2009. Dr. Laiza has worked at the practice for years as an assistant and receptionist. She is a new mom to a precious little girl, Valentina, whom if you’re lucky you’ll sometimes see at the front office with her Grandma Netty! Dr. Laiza is also Dr. Isaías Íñiguez’s oldest daughter and his personal mini-me! and join the family business. Dr. Laiza is known for making her patients feel comfortable and welcome. Dr. Íñiguez Smith’s hobbies include cooking and working out at her husband’s CrossFit gym in downtown Yuma, AZ. A lover of travel and new culinary experiences, she also enjoys visiting art museums, historical cities, culinary festivals, and going to concerts. Dr. Laiza likes to spend her weekends with her husband Sean, their little girl and their dogs, Andie and Glory. Dr. Javier Ramirez graduated from Universidad Autónoma de Baja California in Mexicali and went on to complete his residency at the Centro de Salud health center in Guadalupe Victoria, Baja California. Dr. Javier is certified in several areas of general and preventative dentistry including Direct Restorations, Dental Emergencies, and the Promotion of Oral Health and Hygiene. Dedicated to his continuing education, he attends dental conferences throughout the year. During his free time, Dr. Javier likes to work on his 86 Mustang, watch indie films, and exercise. Considering himself a musician at heart, he loves to play the guitar, dabble with other instruments, and listen to 80s rock bands. Dr. Javier’s favorite time of the day is when he gets to play with his spunky toddler, Luna. She definitely keeps him on his toes.